MainAll NewsInside IsraelAbbas's Fatah Claims Shooting - What Now? Govt. yet to formulate response to Fatah claiming murder of young couple in front of children; terror group admitted to Iran support. The "armed wing" of Palestinian Authority (PA) Chairman Mahmoud Abbas's Fatah faction claimed responsibility for the horrific murder of a young couple outside Itamar in Samaria on Thursday night, but an Israeli response to Abbas has yet to be formulated by the government. The Martyr Abdul-Qader al-Husseini Brigades, associated with the Al-Aqsa Martyrs' Brigades and likewise affiliated with Fatah, openly posted on its Arabic-language internet site that it claims full responsibility for the "heroic operation." In the attack, Rabbi Eitam Henkin and Naama Henkin of the community of Neria were murdered in front of the eyes of four of their children, as the Arab terrorists shot them in their car. In the flurry of reactions to the attack by Israeli politicians blaming Abbas's ongoing incitement to violence with responsibility for the murder, there has yet to be an open formulation of a response to Fatah for its stated involvement in the attack. The lack of a direct mention of Fatah was apparent in the response of Defense Minister Moshe Ya'alon (Likud), who said, "at this moment the IDF...are in pursuit of the killers. We will hunt them down and not be silent until we place our hands on the murderers and those who sent them." 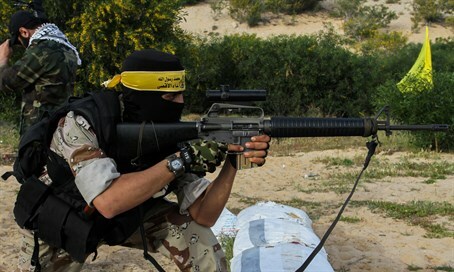 The Martyr Abdul-Qader al-Husseini Brigades was among the Fatah forces who took part in Hamas's terror war against Israel last summer, firing rockets at Israel from Gaza. Abu al-Walid, a spokesperson for the Martyr Abdul-Qader al-Husseini Brigades, told the Lebanese Al-Akhbar in an interview last August during the war that Iran plays a direct role in funding and training his terrorist organization. "There is always contact between the Palestinian resistance and Hezbollah and Iran," he said. "This is no longer a secret." "These contacts take different forms, such as training, preparation, equipment, logistical support and developing the resistance and its weapons." While Abbas and his Fatah faction have often been touted internationally as a "moderate" potential peace partner, it might be anticipated that the claim of responsibility could offer Israel an opportunity to change the paradigm by which it continues to hold Abbas as a legitimate potential partner to an agreement. However, Prime Minister Binyamin Netanyahu in his Thursday UN speech rebuttal to Abbas's abandonment of the 1994 Oslo Accords repeatedly stated he hopes Abbas will return to direct negotiations on a peace deal, indicating that such a paradigm shift might not be forthcoming.